Successfully Added Car Dash Cam And Reverse Camera - Wi-Fi, G-Sensor, Loop Recording, 170-Degrees Recroding, Ignition Start to your Shopping Cart. Increase your safety on the road and make reversing easy with this car Dash cam and reversing camera. This car dash cam and backup camera are quick and easy to install. Use the adhesive back to secure the DVR to your windshield while the rear backup camera attaches effortlessly to your rear window or trunk. 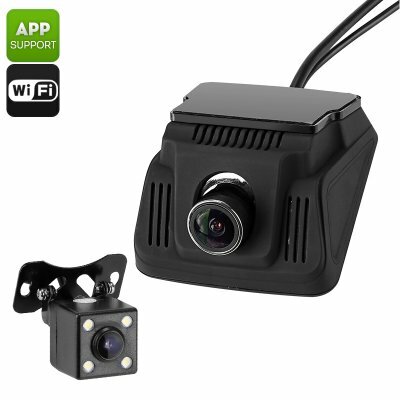 Between them, the cameras bring a detailed view of what's happening around your car and can easily be connected to your car's media player with the AV lead. Alternatively, take advantage of the Wi-Fi connectivity and see the camera feed directly on your smartphone. So there is no need for a display in your car. With improved safety and visual awareness, you will be safer on the roads and can be protected from malicious claims with video evidence of all that unfolds on the road ahead. The collision sensitive and gravity sensor depict any sudden movements and safely lock the current video footage so it can't be recorded over. Loop recording means you'll never run out of storage, with an SD card slot capable of storing up to 32GB of footage you can record scenic journeys as well as any major events that unfold. The 12MP 1/4 inch CMOS sensor will capture high resolutions images so not a single detail is missed. Powered directly through your car's power supply this DVR will turn on when you start the ignition. So you don't have to worry about remembering to press record. This car DVR and backup camera kit comes with a 12 months warranty, brought to you by the leader in electronic devices as well as wholesale car video gadgets..